As far as animated Halloween episodes go, “Nightmare on Ocean Avenue Street” is a fairly unadventurous entry into the category. 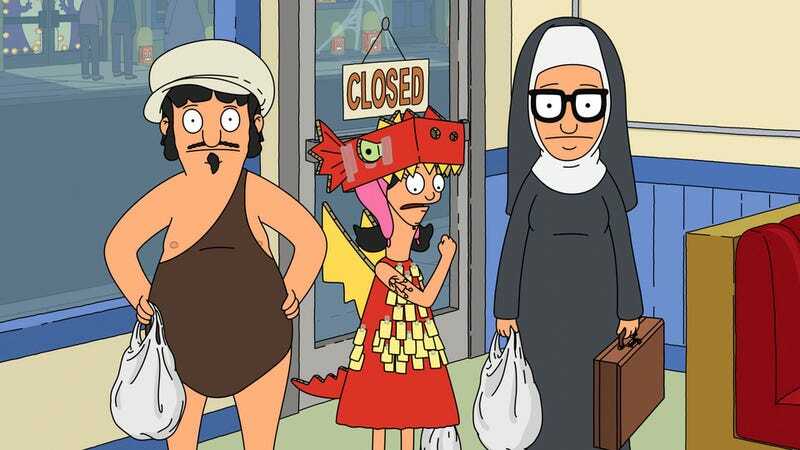 While other shows ramp up the antics on Halloween night, Bob’s Burgers keeps things simple this year with a Scooby-Doo-esque mystery. 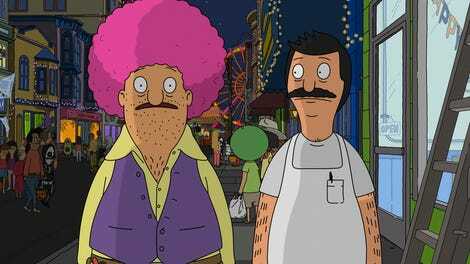 Luckily, Bob’s Burgers does well with simple, so there are still plenty of jokes, even if this feels like the season’s least energetic episode so far. "Nightmare on Ocean Avenue Street"
A slow B plot with Linda, Bob and Teddy is mostly to blame for the loss of momentum. While this trio usually does great work together, they’re motivated by a random grudge Teddy has with another handyman. Since Linda and Bob don’t really have any stakes in Teddy’s Halloween decorations, the story doesn’t really go anywhere. Linda gets a great moment with the kids and their costumes and it’s a funny enough reveal when we learn that Teddy’s nemesis really just respects him, but it feels as satisfying as that “Those Who Can, Dle Candles?” pun. Linda is always great in a holiday episode, but it’s hard for Teddy to replace that energy when he’s the anchor. It would’ve been fun to see more of the competing business owners in the neighborhood, but no on even gets the chance to make fun of Bob for buying Dr. Peter’s Bitter Drops. It is a great episode for Teddy and Bob’s friendship, which has moved into a wonderful area of sincerity in recent seasons. Teddy doesn’t feel like he’s just a punchline anymore. He’s even given a moment to express how he actually feels about working for Bob. The kids keep the energy going as they try to figure out who’s stealing trick-or-treat bags. While Louise initially suspects a gang of teenagers, the culprit ends up being Dr. Yap in an astronaut/gorilla/devil/goalie named Jason costume. It’s fun watching Louise and the gang attempt to outsmart a candy thief, but it doesn’t mirror the group antics of “The Taking of Funtime One Two Three” from earlier this season. Most of the episode’s fun comes from watching the kids enjoy the holiday. It’s a magical night where the kids are free to do as they please. It’s even a win for Rudy and his iconic Paul Rudd costume. Halloween is also a great opportunity to explore the gap between the kids and the teenagers. Tina has matured a lot this season, but she still hasn’t reached the teenage angst levels of Jimmy Jr. Even though she has adult teeth, she’s not focused on safe bets. Jimmy and Zeke may think they’re ready for a terrifying haunted house, but Tina is the one who actually makes it inside and takes down the bad guy. She may still be a “Hallow-tweener,” but she gets to decide if she rots her teeth out. Dr. Yap is serviceable as the episode’s villain, but the Belchers have a long list of enemies who could’ve played the role. Sure, it doesn’t entirely make sense...as someone points out, Dr. Yap makes more money if kids get cavities, but Dr. Yap isn’t a character who needs a complex motive. “Nightmare on Ocean Avenue Street” is a simple whodunit that gives us Gene in an Andre 3000 the Giant costume and for that alone, we should be thankful. “Money is just candy that hasn’t been born yet.” - Exactly, Tina. Loved the Salt-N-Pepa “None of Your Business” cover at the end. Even though it was brief, I love little moments between Gene and Tina like the one outside the haunted house. A dragon with a girl tattoo...are kids really that clever? I hope this is the start of a new friendship for Teddy. Maybe that’ll make Bob appreciate him more. I would absolutely try that candy.